Another night of great darts, this time from the 'B' League boys, as 28 entered for the 'B' League Singles. 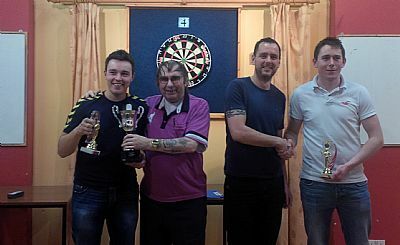 With the singles champion Jamie Drever and former champ Derek Firth both going out in the first round, a new champion would be crowned. Lots of very good players were still in contention and, in the top half, two of the best clashed in the semi-final, with Ryan Tulloch just getting the better of Brett Dickenson 3 - 2. It was a little easier for Scott Walls, as he beat Erlend Lennie 3 - 0 in his semi-final, with Ryan showing the way by taking a 3 - 2 lead, needing only one more for the title. However, Scott was far from beaten, as he took the next two games for a dramatic 4 - 3 win. In the leagues, far too many games are not getting played. Already there are six games outstanding, and one team has two games to catch up. In a small league like the K-DDL, no games should go more than two weeks behind. In the Williamsons 'A' League, there's no holding the Legion back as they stroked up win number 81, with a 9 - 3 defeat of the Wanderers. It looks like the fight for runners-up spot will be the one to concentrate on, as the Golf Club and Commodores slug it out. The Golf boys are clear in second spot after an 8 - 4 win over Untouchables 'A'. The Commodores beat Shapinsay 9 - 3 in a postponed game, and trail the Golf Club by three points, but have a game in hand, as their game versus Quoyburray wasn't played. Shapinsay's other game against Quoyburray 'B' was also called off. A great 7 - 5 win for RBLM over Sanday brings them up to seventh in the league. Top score of the week went to Untouchables, as they put 11 past the Murray Arms. In the Williamsons 'B' League, a very good result for the Legion Arrows, as they held the league-leaders The Nomads to a six-all draw, but Sands '2' couldn't take advantage as there's no score in from their game with the St Ola, as in the game between the Sands and Motorhoose. There was a good 9 - 3 win for Meadowbank over the Likely Lads, and the Deerness v Bilco Boys ended a 6 - 6 draw. The Shore had a good home win over Tankerness - 8 - 4 was the score. 180s from Gordon Rendall, Stevie Linklater, Robert Gatt, Alan Gray, Brian Murray, James Flett, Ivan Leslie, Brian Moar, Craig Taylor, Keith Bain, Billy Ward, Graham Louttit, Robbie Norquoy, George Low, and two from Roy Foubister, Kevin Gray, Ian Eunson, Scott Walls and Brett Dickenson. High checkouts: 100 from Stevie Linklater; 102 Dave Noble and Michael Coghill; 106 Michael Bain; 111 and 116 Neil Croy; 116 and 120 Erland Lennie; 127 Wayne Small; 129 on the bull Malcolm Coghill; and 140 Brett Dickenson. It's back to the ranking points this Friday night, with the league doubles in the Legion at 7.30pm. Scott Walls beat Ryan Tulloch 4 - 3. Quoyburray v Commodores, no score; OGC 8, Untouchables 'A' 4; Sanday 5, RBLM 7; Wanderers 3, Legion 9; Untouchables 11, Murray Arms 1; Shapinsay v Quoyburray 'B' - no score; Commodores 9, Shapinsay 3. Likely Lads 3, Meadowbank 9; Shore 8, Tankerness 4; Legion Arrows 6, Nomads 6; Deerness 6, Bilco Boys 6; St Ola v Sands '2' - no score; Sands v Motorhoose - no score. Friday, February 14 - League Doubles, Legion, 7.30pm. Untouchables 'A' v Untouchables; Commodores v Wanderers; Quoyburray v Sanday; OGC v Shapinsay; Legion v Murray Arms; RBLM v Quoyburray 'B'. Motorhoose v Shore; Bilco Boys v Likely Lads; Nomads v Meadowbank; Sands '2' v Tankerness; St Ola v Legion Arrows; Sands v Deerness.